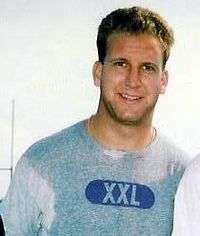 Gino Louis Torretta (born August 10, 1970) is a former American college and professional football player who was a quarterback in the National Football League (NFL) for five seasons. He played college football for the University of Miami, won the Heisman Trophy in 1992, and was a member of the Miami Hurricanes' national championship teams of 1989 and 1991. A seventh-round pick in the 1993 NFL Draft, he was a member of several NFL teams, but never became a regular starter as a pro. He was inducted into the College Football Hall of Fame in 2010. Torretta was born in Pinole, California. He graduated from Pinole Valley High School, where he was a standout high school football quarterback for the Pinole Spartans. Torretta accepted an athletic scholarship to attend the University of Miami, where he played for the Miami Hurricanes football team from 1989 to 1992. As a quarterback for the Hurricanes, Torretta spent his first two seasons mostly on the bench behind then starting quarterback Craig Erickson, with his only significant playing time coming with three starts in 1989 after Erickson injured his throwing hand. During that span, however, the then-unknown Torretta lit up San Diego State for 485 yards, setting a school record for most passing yards in a game that was only broken on September 29, 2012 by Stephen Morris. In his first year as a starter, Torretta garnered further attention by stealing the show in a nationally-televised 1991 game versus the Houston Cougars and their Heisman-frontrunning quarterback, David Klingler. As Miami's defense cut down Houston's run-and-shoot offense, Torretta put on the performance that many expected out of Klingler en route to a 40–10 victory; Klingler's lone touchdown pass in the game came with three seconds left in the fourth quarter against Miami's third-string defense, long after the game was decided. Torretta went on to lead Miami to a fourth-quarter comeback win on the road versus #1 Florida State and ultimately to an undefeated season and a co-national championship. Torretta passed for more than 3,000 yards his senior year in 1992 on his way to winning the Heisman and the Davey O'Brien Award that season. He also won the Walter Camp Award, the Maxwell Award, the Johnny Unitas Trophy and the Chic Harley Award. One of the key games of the season came against West Virginia when he threw for 363 yards and two touchdowns in the 35–23 victory. His career as quarterback at Miami was hugely successful, with Torretta leading the team to 26 wins and only one loss. In the 1993 Sugar Bowl, Torretta's Hurricanes were dominated by the Alabama Crimson Tide's defense. Alabama won the game, 34–13, and the national championship. Despite his collegiate-level success, Torretta was not a top NFL draft pick, and his NFL career was fairly unremarkable. He was not selected until the Minnesota Vikings took him in the seventh round in the 1993 NFL draft and then did not play him at all that year. In 1994, Torretta was on the Vikings' roster, and then was picked up by the Detroit Lions. As was the case in 1993, he failed to play at all in 1994, serving the entire season in a backup role with the Lions. In 1995, Torretta moved to NFL Europe and was also on the roster for the San Francisco 49ers and Detroit Lions but again was relegated to backup roles. He was cut by the 49ers in 1996 and subsequently picked up by the Seattle Seahawks. His only chance to play in an NFL game came in the 1996 season finale when he came off the bench for the Seahawks against the Oakland Raiders. He immediately threw a 32-yard touchdown pass to Joey Galloway that put Seattle ahead, leading the team to victory. In 1997, Torretta was on the roster for Seattle and later the Indianapolis Colts but again did not play. After that season, he retired from the NFL. Torretta followed his NFL career with a position at Wachovia Securities as a Senior Financial Advisor. He is Chairman/CEO of Touchdown Radio, broadcasting an NCAA game of the week on national radio. He is also a NCAA football expert on Sirius/XM channel 91—college sports nation. Torretta is Vice President for GAMCO Asset Management, working with Institutional clients nationwide and working out of the firm's Palm Beach office.